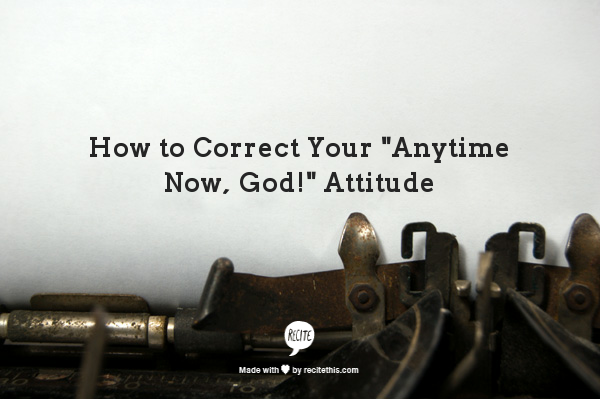 In the past as I have lifted up prayer requests to God, I have often done so with the attitude of wanting God to answer them “anytime now”. I am always ready for Him to answer my prayers, but what if He did answer immediately? Do you suppose it would cost us something? More than likely. Watch my video to find out why. For Your Moment of Clarity: Realize that God’s timing is perfect timing, and He always answers at the “right time”. There are man scriptures that say “at the right time”. God is not careless with our prayers. He is intentional in accomplishing His will. We would do well to have the same attitude. For Organizing Your Prayer Closet: Begin making note of when God answers your prayers. Make note of anytime you realize that God’s answer was at the “right time”. From this, you will become more patient in your prayers. the importance of having someone there when needed the most. battles all the days of their lives. just does not exist in the first place. At least as far as biblical context would have us believe. I hope I can encourage you by saying that God is never absent. One of the best things I have ever done with my prayer life is structured prayer journaling. It helps me see the threaded needle of answers that bring sense and comofort to the rest of my life. If nothing else, start out with a simple list of written prayers. As you see God answer them, write the answer beside them. I believe you will be, like I was, totally surprised that God answers prayers. Who knew??? More than answering prayer, it would be much more correct to say that God answers me! I hope you check out my book, Organizing Your Prayer Closet, but if not, you can see the hand of God moving in my prayer life in my prayer journaling videos. From my videos, I think you will get a clearer picture that although we like God answering prayer requests, He is also much more interested in every aspect of our lives. What He has shown me, He will be glad to show you. God bless, and thank you for stopping by!